Envolution is a frequency-dependent envelope shaper with separate transient and sustain sections to radically re-shape the sonic envelope of your instruments or audio. Use a broader tilt mode or the more parametric-style focus mode to choose which frequencies are processed. Insert on a track, bus or even master output to add presence/distance to drums, piano, guitar and any other percussive content. Boost sustain to make the ambience around a recording bloom, or cut it for quick and precise gating. We love the more creative and extreme side of the plug-in too; like using the DIFF button to generate negative ratio compression effects! This plug-in offers 2 activations for each product licence you own. "I've been combing through recordings tracked years ago, using Envolution to fix everything in my life that I've done wrong; murky pianos, lifeless room mics, bass amps (whoa! ), and of course, the damn kick drum. I love Envolution. Not only a great fixing tool, but also an extremely creative one too." "Another excellent and genuinely useful tool from Sonnox that has applications across a range of percussive and plucked or struck sounds." "You'll be staggered by the range of mix applications in which this processor can make a significant mark." "Oxford Envolution is a very useful tool. People after options will love the control, not only over the frequencies that are processed, but also the attack and release envelopes for both the Transient and Sustain portions of the signal." 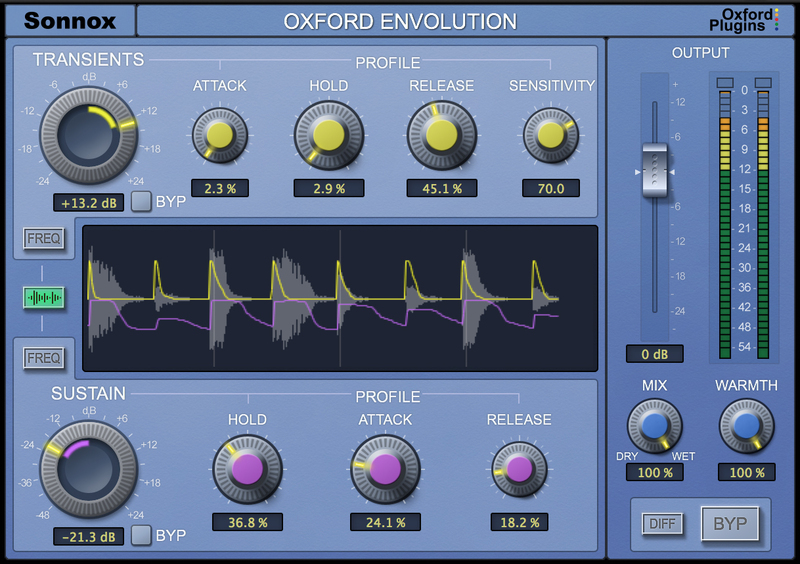 "Uniquely powerful, flexible and reasonably priced, Oxford Envolution is a terrific-sounding plug-in every mix engineer should own." "Subtle, aggressive or anything in between… all sounding brilliant."